Lee Mason inspired a second half comeback from South Shields as they remained four points clear at the top of the Evo-Stik North Division on Tuesday. Lee Mason inspired a second half comeback from South Shields as they remained on course for the Evo-Stik North Division title last night. The Mariners found themselves a goal behind away to bottom side Goole at half-time after a poor first half display. However, Mason struck twice inside the first nine minutes of the second half to turn the game on its head and take his tally to six goals in his last five games. Substitute Dan Lowther wrapped up the points late on for Shields on his league debut for the club. It was the second time Goole had caused the Mariners problems this season, having held out at 0-0 in the reverse fixture until the closing stages before succumbing to a 2-0 defeat. Shields appeared to have the measure of them in the early stages this time around, with Mason played in on goal inside the first two minutes before seeing his shot beaten away by goalkeeper Ben Saynor. There was also an early sighter of goal for Michael Richardson, whose effort from the edge of the box was kept out by Saynor. The home side began to get a foothold, though, and their first attempt drew a decent save from Liam Connell as Nathan Curtis’ header looked set to find the corner. Connell also did well to palm a long-range effort from Daniel Horton behind for a corner, while at the other end, Jon Shaw was denied by Saynor. The hosts got their noses in front 10 minutes before half-time when Shields failed to clear a corner and John Lock forced the ball over the line. The Mariners were in need of a strong response after the break, and after an offside Louis Storey hit the post with a volley, they built some momentum. Mason netted the equaliser in the 50th minute when he met a superb cross from the left by Storey with a bullet header to give Saynor no chance. Holmes was kept off the scoresheet by Saynor soon after, but he could do little to handle Mason. He was soon played in on goal by a terrific through ball from Robert Briggs, and he rounded Saynor before coolly slotting home. Chances were harder to come by in the remainder of the second half, but substitute Aksel Juul whistled a shot not far wide before the points were sealed five minutes before the end. Michael Richardson got in behind on the inside-right of the box and when his initial cross was blocked back to him, he picked out Lowther to slide home from close range and score his third senior goal in as many appearances for the Mariners. The win kept Shields ahead of Hyde United and Scarborough Athletic by four and five points respectively, and they have a game in hand on both. On Thursday, they host Coalville Town in the semi-final of the League Cup at Mariners Park. 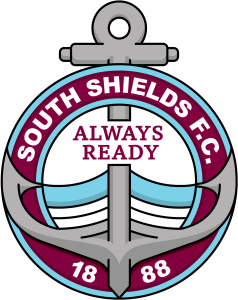 SOUTH SHIELDS: Connell, Baxter, Lough, Shaw (c), Morse, Ross (Lowther 81), Storey, Briggs, Mason (Armstrong 87), Richardson, Holmes (Juul 58). Subs not used: Woolston, Nicholson. Goals: Mason (50, 54), Lowther (85). WORDS: Daniel Prince. IMAGE: Dan Lewis.